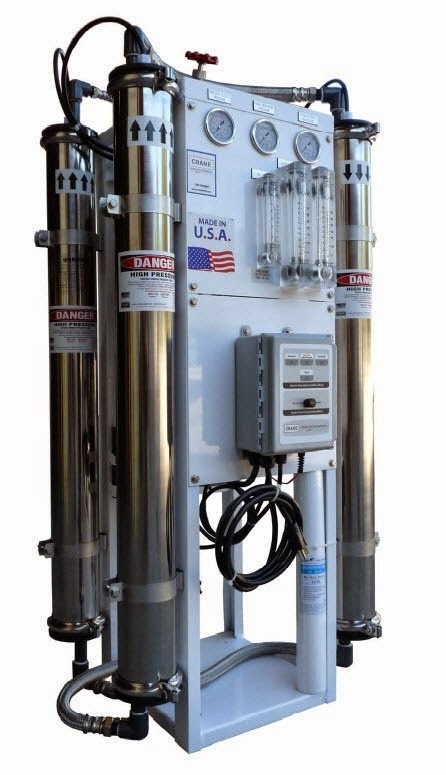 Clean Well Water Report: Can I Use a Commercial Reverse Osmosis System to Remove Iron and Total Dissolved Solids? Can I Use a Commercial Reverse Osmosis System to Remove Iron and Total Dissolved Solids? We have a small indoor nursery hydroponic growing operation that requires purified water, and we are looking at 6000 gallon per day RO systems. See attached water test report, our well also has high levels of iron. Can we use the RO to remove both iron and TDS? As you can see our water is soft, our main problems are high TDS and high levels of iron. We are in Canada. Have you ever worked with grow operations? We already have a plastic storage tank and booster pump, primarily we are looking for the RO system. Thanks for emailing. 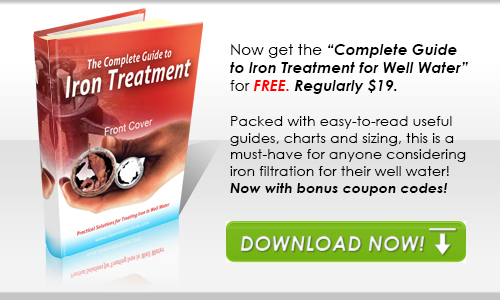 For your application we recommend an iron filter ahead of the reverse osmosis system. Reverse osmosis membranes cannot be exposed to high levels of iron over 0.2 PPM. The Pro-OX iron filter system below will remove the iron prior to the RO system. Yes we have extensive experience with nurseries and indoor growing operations! To the right is a picture of the system used by one our clients, a nursery in California that is still using the same system we supplied over 20 years ago. They change their membranes about every 5 years. Your water is soft, but if the water is hard or has high hardness, we recommend anti-scalant solution or a water softener, in addition to the iron filter. Below are some recommendations for what systems would work well for your application. Options included with this system would be Control Panel with TDS display, Three Phase 480Volt/60 Hz Pump, Fast Flush upon start-up, and Recycle Valve option. This system produces high quality purified water by reverse osmosis thin film (TFC) membrane using a high pressure pump (included). • The unit comes with a white powder-coated steel frame; stainless steel braided hoses; inlet solenoid valve; and stainless steel concentrate control valve. 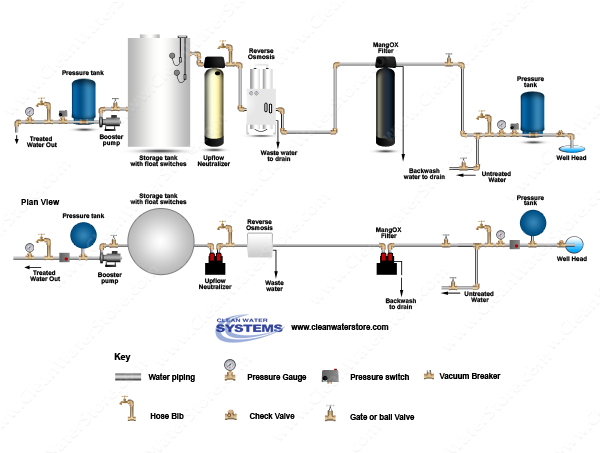 • To make service and operation easier this unit includes many options not normally included in other base-unit reverse osmosis systems such as: 5-micron pre-filter; pure-water (permeate) flow meter; waste-water (concentrate) flow meter; PVC pressure vessels; and automatic feed-water shut-off valve. • The pressure gauges included display pressure for the high pressure pump; inlet water pressure and pre-filter outlet; making it easy to diagnose and track pressure across the pre-filter. • An excellent control panel package includes a UL listed control box with On/Off Switch; low-inlet water protection; function LEDs; and contacts to set up float switches in a storage tank. • The control box also features contacts for locking out pretreatment filters during backwash and makes it easy to connect anti-scalant pumps. This commercial reverse osmosis system removes total dissolved solids; chlorides; sodium; boron; fluoride; minerals and other salts using high-rejection high quality thin-film reverse osmosis membranes. • Pro-OX contains 80% manganese dioxide in an extremely unique cluster format for enhanced performance and maximized capacity. • Chlorine is to be used every month or so by means of the filter strainer prior, in order to regenerate the media during a backwash so that it can continue excelling in filtration. • The Fleck 7000-SXT features an over-sized distributor tube rather than the standard 1” resulting in higher flow-rates with minimal pressure loss. Dimensions: 14" diameter x 65" height ¾", 1”, or 1 ¼” pipe connectors & Bypass valve is included. All installation and start-up information will be included as well. Excellent warranty: 10 years on the Pro-OX media tank; 5 years on the control valve.